Today, I’m honored to share my experience of trying to give up plastic at a TEDx event hosted by DePaul University. I’m so excited to have this opportunity (and also quite nervous!). Yet, in spite of my nerves, I’m hoping this talk will give me the chance to help raise even a small wave of awareness about plastic pollution and our human role in it. I hope my message will also give listeners a feeling of personal empowerment, that there is a little each of us can do to start addressing this world problem. It was difficult for me to apply to speak. If you know me, you know that I’m not always the most outspoken person (unless I’m talking about dessert), so today will be a challenge in not only trying to share my message eloquently, but also in trying to conquer my internal fears of standing up in front of a large audience and performing. I’m trying to remind myself that I’m doing this for my son, Charlie, and for all those magical whales out there. Thanks to the very many of you who have supported me through this process, through the actual challenge of trying to give up plastic from April 2015 to April 2016, and through these past several months as I’ve prepared and stressed and wondered if I could get through today. I’ve got my whale earrings on, and I’m ready to tell my story. Many, many thanks for all the care and support. It’s taken me a great while to get to this point, but finally, I’ve counted all of the plastic I hoarded over the past 365 days. It took me months to do it. For those of you reading my blog for the first time, here’s a little background: from April 22, 2015 (which was Earth Day) through April 22, 2016, I decided to conduct an experiment to see how much plastic I use on a day-to-day basis. This “experiment” sprung from my worry about the plastic accumulating in our oceans and in other large bodies of water. I was curious to see how much a single person might be contributing to this problem annually. My challenge dictated the following: I tried to give up as much plastic as I possibly could, but when I couldn’t avoid it, I tried to opt for recyclable or biodegradable plastic (the page called My Plastic Challenge lists my self-imposed rules). But whether it was recyclable or not, every plastic item that I bought and used within that time period and, normally, would have disposed of, I kept instead. I ended this spring swimming in a Pacific Garbage Patch of my own making. It was strange—when I’d finished and gathered it all in one room—to stare at the heaps and piles of plastic, and it’s strange now to sit back and look at the numbers. In total, I used 1,441 different pieces of plastic in a year’s time. This figure doesn’t account for the plastic I couldn’t easily count, such as weirdly sized sheets of bubble wrap and loose plastic stuffing pulled from destroyed dog toys, and this number is a little misleading: one “piece” of plastic counts as both a single plastic screw-off soda top as well as a gallon-sized jug of milk. I tried to count items individually because some containers might, for example, have a cardboard “body” but a plastic lid or straw attached (think juice boxes). I tried to capture numbers for each separate unit of plastic I consumed. I did my best to capture everything I used in the following document, but you will quickly see that I’m no scientist. If you have feedback on how I could more accurately represent these numbers (or calculate my plastic usage), I would love to know your thoughts! As I expected, the largest category of plastic usage was “#3: Eating.” I used 441 pieces of plastic in this category, from take-out containers, to plastic bread bags, to plastic silverware. Yet, the most eye-opening category for me was #4: Mail/Business. We all complain about getting too much junk mail, and now I have hard proof that it’s not only excessive in volume, but also in plastic. Those plastic-windowed envelopes sure make mass mailings easier, but they also harm our planet to a degree I had not before considered. I was also surprised to reflect on how much plastic I use when buying homegoods (such as batteries or light bulbs)—I purchased a standing lamp from Home Depot that came in a Styrofoam box so gigantic it could double as a comfortable home for my fifty-pound dog. All in all, I was genuinely surprised by how much plastic I accumulated. I tried really, really hard not to, and still I ended up with almost 1,500 items. I hope you’ll look at my list and tell me your thoughts. Do these numbers surprise you? Did you actually think I would accumulate more plastic in a year’s time? Or, like me, do these numbers shock you and scare you, especially when you consider that I tried to accumulate no plastic at all? I wanted to address the fact that I didn’t end up weighing all of this year’s plastic. Originally, I had wanted to get a number in pounds so that I could make a donation to charity equivalent to $10 per every pound of plastic I amassed. However, I wasn’t able to figure out a reliable way to weigh my load, and transporting it elsewhere for accurate weighing proved unmanageable. I want to stay true to my word, though, so I’ve decided to give $144.10 (representative of my total number of plastic items) to a nonprofit working to educate the public about plastic pollution and fighting to reduce waste. Stay tuned for my decision—I’m going to do some research to learn more about organizations doing this work—I’m excited to see what’s out there! And, as always, I am wide open to suggestions! What Can We Recycle, and Where? It has been over two months since my plastic adventure ended. It was the end of April when I stopped my hoarding, and it was the beginning of May when I piled up all of my accumulated plastic in the front of my apartment, marveling at all I’d used in a year. Here the plastic sat untouched for a month, a daily eyesore, until my husband hinted and hinted and then outright begged for me to clear it from our lives. Like most of the projects I embark on, I initially had great plans for the “sorting” and “cataloging” of my plastic. Before I was actually faced with these tasks, I thought about all I would discover in the process of studying the plastic and gathering together like items to see what I consumed most. But when it came time to actually start, I felt utterly overwhelmed. I stood in the midst of the piles like a lost bird. It was dreadful getting going. Sorting and counting plastic. Wow, what an exciting life I lead! Somehow, I found the motivation. I spent a dedicated two weeks methodically picking through the piles, tossing similar items together, counting, photographing and tallying up the various plastics. I’m still not completely finished with the counting and clearing, but now, at the end of June, I’m almost there. I used 22 disposable cups. This stuff took hours to count. I felt physically lightened—honestly, I felt like I could breathe more deeply—when I was finished counting food containers and plastic liners and when I gathered up these piles. Finally, they could be taken out of my apartment and to the recycling center. I stuffed the back of my car with large boxes and bags of plastic detritus, having a recycling center destination pre-programmed into my phone. But, when I reached this center, really a “drop-off” location with no staff on site, I hit a wall again, this time, one not made of my own inertia. I heaved my bags and boxes towards the line of blue dumpsters, and when I reached them, I noticed a faded sign telling me the “Items NOT to be Included.” Some of the items on this list include plastic grocery bags, Styrofoam, and plastic wrap, some of my main plastic offenders. I deposited what I could, and then I lugged the rest back to the car. I realized when I drove back to my apartment, feeling deflated, that I should have done more research on what could be recycled (and where) before I carted everything out to center. I started to feel some anxiety returning. Still, as I write this post, I have a tub of Styrofoam and a giant garbage bag filled with plastic bags sitting in the trunk of my car. These are things the city of Chicago cannot recycle. Plastics with the Number 6 label are those made of polystyrene, or Styrofoam, and they cannot easily be recycled (or perhaps cannot be recycled at all). I don’t know why this is, but I plan to find out. I wasn’t greatly surprised that I couldn’t rid myself of my Styrofoam right away. However, I was surprised to learn how tricky it would be to recycle plastic bags. Chicago recycling centers won’t take them because they get caught in the giant sorting machines. There are locations, which I found by visiting a website called plasticfilmrecycling.org, that take plastic bags and plastic liners, but after visiting a few of these suggested locations, I found meager-sized receptacles that I didn’t feel comfortable stuffing my gobs of plastic into. My plastic bag supply would immediately overwhelm this bin. I have such a giant amount of bags and plastic liners, so I’m determined to find a way to dispose of them sustainably. It might boil down to me, slowly, over time, depositing small amounts in these shared receptacles. That’s not convenient, but might be my only option. I really wish recycling was easier. For instance, before my attempts to clean up my apartment, I had just assumed that if a piece of plastic had a recycling symbol on it, it could be thrown into a recycling bin. Not so, it turns out. And many plastics beyond those with the Number 6, such as straws, plastic utensils, plastic food bags, and bubble wrap, can’t be recycled either. Here’s a list both of what the city of Chicago advises should be recycled and what should be thrown in the trash. This list, while very helpful, is not exhaustive. What do I do with plastic wine corks, for example? Or what about empty mascara or deodorant containers? What about coffee bags or cheese containers or pieces of broken nylon dog chews? It’s hard to fully understand the rules. And it takes time to discover what should be done with each item. In the coming weeks, I hope to speak with someone working in Chicago’s recycling program to learn more about what goes where and why, but many people will not do this and cannot do this. We are all pressed for time. What if we could throw everything…cans, boxes, plastic jugs, plastic bags, straws, plastic forks…anything not made of organic waste (which could be composted) or not potentially toxic into those blue recycling dumpsters? Couldn’t that lead to greater employment at recycling facilities? Wouldn’t that encourage people to recycle more? Could that even encourage more recycling innovation? This could be so, but it all would require more expensive equipment and more advanced recycling centers. It would mean more safeguards for recycling center employees, more paychecks, and more vehicles to transport materials…essentially more money. And when I live in a city that has now been without a state budget for an entire fiscal year, that seems complete and utter fantasy. It’s strange to be throwing plastic away again. I’m still not used to unwrapping cellophane from new magazines and tossing it into the trash, or putting empty medicine bottles into the recycling bin. As I expected, it’s a huge relief. It is so nice to no longer be hoarding plastic. Yet there’s a twinge of guilt whenever I throw a bit of plastic away. After a year of collecting every piece of plastic I’ve used, I have a clearer understanding of how much waste I produce. I’ve had a chance to see my life’s habits and choices on a macro level, and it has shifted my perspective seismically. The weekend after Earth Day, on April 23rd, I gathered together all of the plastic I accumulated over the past year. I stacked the rubber bins and the cardboard boxes and the stuffed paper sacks in the front room of my apartment, and then I stood back and marveled. What I have to remind myself is that, to some people, this may not look like a lot of plastic. Yes, it fills a full room, but it’s not a really astonishing amount. It doesn’t soar to the ceiling, and it’s surprisingly light. I carried this entire haul up from my apartment’s storage unit in three easy trips. But this mini mountain of plastic is what I accumulated in a year of trying hard not to use any at all. This is what has really powerfully shifted my perspective. Over the past year, I actively told store clerks and grocery staff and waiters and waitresses that I was trying to make purchases or order meals without the use of plastic, so I greatly cut down what I normally would have been given. I’m curious now to see how much I would have collected had I not tried to steer clear of plastic. Double this amount? Triple? It’s impossible to say, and my days of keeping, cleaning, and storing plastic for experimental value are over. When I stand back and stare at this load, it alarms me. In the past few weeks, I’ve begun the process of sorting and cataloging my plastic, and this, too, has been eye-opening. The amount of plastic cups, straws, windowed envelopes, plastic sleeves, and especially to-go boxes, seem to multiply as I pour them out of various bins and bags like items pulled and pulled from Mary Poppins’s magic suitcase. I will be sharing some of those final counts in coming posts. For now, when I look at this mountain of plastic, I think of all of the people in America. In the world. I think of my small year’s cache of plastic floating in the ocean, and it isn’t hard to visualize the scale of what must be out there, and growing. In less than two weeks, on April 22nd, 2016, the plastic challenge that I’ve committed to for the past year will come to an end. I will stop having to collect and store and stress over a growing hoard of plastic debris filling the nooks and crannies of my apartment. I’m so relieved—I can’t wait to be liberated from it. I’m also strangely excited to lay all of my plastic out, inventory exactly what I’ve collected in 365 (well, 366 this leap year) days. I’m curious to see just how many plastic straws I’ve used, and how many plastic forks. I’m interested to know how many plastic cheese wrappers I’ve tucked away, and how many plastic-windowed envelopes. But already, before I take an official inventory and count the like items in my stash, I know what the single biggest plastic offender will be. I know this because I’m constantly cleaning and nesting them together to fit them in my growing collection. That great offender is plastic food containers. These include Styrofoam boxes for restaurant leftovers, and plastic containers for take-out food. This includes the giant plastic platter and lid from Evan’s Dairy Queen birthday cake, and the tiny plastic ramekins that transport salsas and chutneys and salad dressings from restaurants to my home. It includes containers from Whole Foods’ sushi and cellophane from deli sandwiches. The list goes on. And on. During the first few months of my challenge, I was very aware of the plastic bomb of take-out or delivery food orders, and I worked hard to cull my addiction to restaurant eating. But recently, especially with the addition of our dog, I’ve grown lazy. The second week we had our puppy, I think my husband and I ordered food every single night—we didn’t have the energy or the time to cook dinner. That embarrassment of a week, (when we actually started to get a little sick of our favorite restaurants), I watched a mountain of washed plastic containers grow in my drying rack, stacked so high that they showered down like a card castle when even barely disturbed. I was astonished with just how much plastic I accrued in a single week. Ordering food is not only a financial drain, but also a massive waste of plastic. I knew this already of course, but it hadn’t registered as potently for me as it has in recent weeks when my ordering of food reached an apex. Yet, while it’s genuinely astonishing to see how much plastic comes with a single food order, there’s also so much plastic attached to food from grocery stores. In previous posts, I’ve talked about my struggle to buy cheese and meat without plastic, but it’s even challenging to buy pasta, spices, beverages, condiments, and breads that come plastic-free. Sliced bread is sold exclusively in plastic bags, and there’s good reason: it stays soft. Whether from a restaurant or grocery, buying food means an accumulation of plastic. And what is additionally problematic is how much food we waste every day in America—a problem as equally gargantuan as the environmental concern. I read a really fascinating study conducted in 2012 by the National Resources Defense Council (NRDC) about the food that Americans throw out. The author, Dana Gunders, found that each year we throw away about 40% of our food. And into the garbage with that 40% goes not only food (which could feed many, many hungry people) but also wasted time, water, energy, and packaging—much of it plastic. Have you noticed the growing trend of wrapping cucumbers in saran wrap at supermarkets? What about the pre-cut fruits in plastic cubes, or the plastic bags of grapes or apples or carrots? I think this plastic-wrapping is a technique by food sellers to encourage shoppers to buy more produce (perhaps making them look more sanitary or ready-to-eat? ), and thus it might decrease some food waste. But even wrapped in plastic, fruits and veggies still spoil quickly, meaning we throw out not only produce in devastating quantities, but also the packaging that goes with it. The NRDC study found that, at a loss of 52%, fruits and vegetables are the overall largest wasted food group. I’m a great offender of food waste, especially with my addiction to take-out. With the rate we throw away food, it’s not a wonder that our landfills and beaches and bodies of water are clogged with plastic. And this article made me really appreciate the additional losses—fresh water, labor, all those fruits and veggies that aren’t attractive enough to sell. Many years ago, when I was going through a rough period of life, my mom gave me a self-help book called “When Am I Going To Be Happy?” I still remember a piece of advice that I read in that book about how to cope when you feel like you’re facing so many coexisting personal problems—stress, sadness, anger, dissatisfaction—that these problems seem insurmountable. How can you address them all? How could you ever get better? The author, Penelope Russianoff, tells readers to imagine all of their problems as a can of worms—squiggling, unattractive, gross worms. She says to focus mentally on one worm, just one, and to visualize extracting that particular worm from the overstuffed can. Deal with that one worm first, she advises. One at a time. Strangely, in dealing with that single issue, other problems also seem to lessen. You gain confidence in the possibility of change. I can’t help but think of this book as I consider the seemingly insurmountable environmental issues we face in our world—pollution, water shortages, methane-exhaling landfills, plastic in our oceans—which are also interconnected to problems of animal cruelty and labor inequality and yearly dumps of uneaten food. If we could focus on one “worm”—genuinely take steps to end the harm we’re inflicting in one area, collectively acknowledge the need for change—it seems our attention would naturally turn to other problems, and we might gain confidence. This idea brings me hope—that once we’re ready to more sincerely tackle our wasteful practices, ready to surmount political, religious, and social differences and ideologies, we could slowly begin to change this planet for the better, we could gently start to upend our sinking ship. Last week, my husband and I adopted a puppy. She is fuzzy and black with a little white spot on her nose and is so adorable when she gets tired and her long pink tongue hangs out of her mouth. She is also peeing and pooping everywhere in our house. I knew that housebreaking would be a process, taking patience and midnight willpower and constant trips to the backyard to teach her where she’s supposed to “go,” but I didn’t fully appreciate how plastic would factor in to this teaching process, nor to pet ownership in general. There are of course the plastic poop bags—I realized I’d have to buy these when getting our dog, but I didn’t consider just how often our little precious pup would actually need to poop, sometimes nearing seven or eight times a day. Then there’s the deodorizing spray, “Nature’s Miracle,” for masking the scent of her urine, and also the plastic puppy pads for her to use when my husband and I are at work and she needs to go potty. At her age, approximately 10 weeks, her bladder is the size of a ping-pong ball. So, she has to pee…a lot. This equals constant sprays of “Nature’s Miracle,” so many that we’ve already gone through half of a bottle, and this also means lots of puppy pads that quickly get soaked and thrown into the trash. And then there’s the wipes for her dirty paws, and the treats to reward her good behavior—items that come in plastic packaging—and the safe-for-puppy shampoo that won’t hurt her eyes when we suds her up after she digs and rolls in the muddy leaves. It’s sold in a plastic bottle, too, naturally. The list goes on and on. Plastic chew balls, her plastic flea medicine, plastic tags on her new toys. I’ve been trying to think of plastic-free alternatives to use for our pup, but I don’t want to extend my weird experiment on to her too much. It’s one thing for me to experiment on myself with different shampoos and deodorants that don’t come in plastic, but it seems unfair to hold my pup up to the same no-plastic standards. For example, my husband and I thought about trying some canned dog food for our pouch, but when we picked her up from the shelter, the vet told us to keep her on the same food she’d been eating as this would help with her adjustment to her new home. This food, which she loves, is called “Blue Buffalo,” sold of course in a big old plastic bag. The dog food our pup loves, sold of course, in a giant plastic sack. My plastic restrictions have become very relaxed when it comes to my dog. It’s just so hard to avoid, and I want her to be a healthy, happy dog. Most of the products that will keep her this way are sold in plastic. This is the same dilemma I’ve faced in trying to buy plastic-free products for myself—often, the best stuff is sold only in plastic. Even though my plastic challenge has slipped with the addition of our furry family member, there are a few great products I’ve found. For example, a very helpful man at Petco recommended some poop-pick-up bags from a company called Earth Rated. We got some of the green bags that, while not totally biodegradable, do have an additive that helps them break down unlike normal plastic bags. The company also makes a plastic-free white bag that’s sourced from vegetable starches and is 100% biodegradable. I’ve also been following my husband’s lead in using a dog-do-designated shovel to pick up our pup’s poo in our backyard. Our landlord, who lives upstairs and also owns a dog, uses this shovel for his dog’s poop. Directly taking the poop to an outdoor trashcan has helped save us many green plastic bags. We were also able to find a metal dog crate instead of a plastic one, and we found some great dog bowls that are ceramic. And, shortly before getting our dog, a friend invited me to join a neighborhood swap-group on Facebook where people “re-box” items they no longer use and offer them up to others for free. I was able to get some puppy items—a brush, a collar, and a leash, in this way. Trying to go “plastic free” has made me appreciate how powerful second-hand sharing and reusing can be in eliminating waste and halting the constant accumulation of packaging. Perhaps the most powerful pet-ownership lesson I’ve learned, though, has been this: the more effort I put in to caring for my dog and listening to her needs—for instance, the more quickly I take her outside when she’s starting to circle and sniff the floor, and the more willpower I can muster in the wee hours of the morning to take her outside before an accident—leads immediately to less plastic. I save the puppy pads I’d have to replenish and the sprays of deodorizer. Plus, I save her the physical discomfort of an accident inside. This is the same when applied to my own efforts for my self-care. The more effort I put in on a daily basis—from carrying around my reusable bag and hauling my purple coffee mug with me on the train, to making my own food instead of ordering the plastic-bomb of take out—will lead, almost always, to less plastic. So much improvement in our society, I feel, could come from just a little more daily effort. We got our puppy from a shelter, and I’ve wondered since snuggling her adorable tiny muzzle with that precious white spot on her nose why we have a problem with unwanted pets in our society. How can we simultaneously churn out animals at an unsustainable rate at the same time that we send so many animals to die? How can puppy mills continue to exist when so, so many darling pets sit waiting in shelters to be taken to a home instead of being put to sleep? It’s such a strange and awful phenomenon, such a terrible dichotomy, symptomatic of our overarching societal problem of producing too much and not being thoughtful enough about what we do with the excess. We are a society of waste, reflected not only in the products we use and throw in the trash and the plastic floating and sinking into the ocean, but also, quite literally, in the fact that we throw away lives. Surely, with a little more work, a little less inertia, a little more awareness, we could be better. I’m trying to remind myself of this at five in the morning when my puppy whines to be taken out to pee. As my mountain of plastic grows higher and higher, as I feel defeated on a daily basis by the challenge I set forth for myself this year, I have to say that I’ve realized some true plastic-free success when it comes to lotion. At the start of my foray into living without plastic, I bought a product from LUSH called the Organic Therapy Massage Bar. This is essentially lotion in a solid form sold free of any plastic packaging. At first, I had trouble adjusting to this bar. It was difficult to spread it over my skin, especially if my skin was really dry. And I smelled a little like Play-doh (according to my husband) after using it. What was especially difficult for me was the amount of time it took to apply this “lotion.” Those of you who know me are quite aware that I’m not the most punctual person. I’m always scrambling to get out the door in a timely fashion, and especially when it comes to getting ready for work each day, every blessed second counts. After showering, I’m off like a horse in the races, trying to brush my hair, teeth, eyelashes with mascara in record-setting time. I don’t allow myself the time needed to have a slow, leisurely morning. Thus, the extra two or three minutes it took to spread the lotion bar across my arms and legs quickly became a daily frustration. After a couple of months, I abandoned it. It sat ignored in its oval tin. Koelzer Farms Lotion Bar I really loved! Then Christmas came, and I received a second lotion bar as a gift from my mother-in-law. 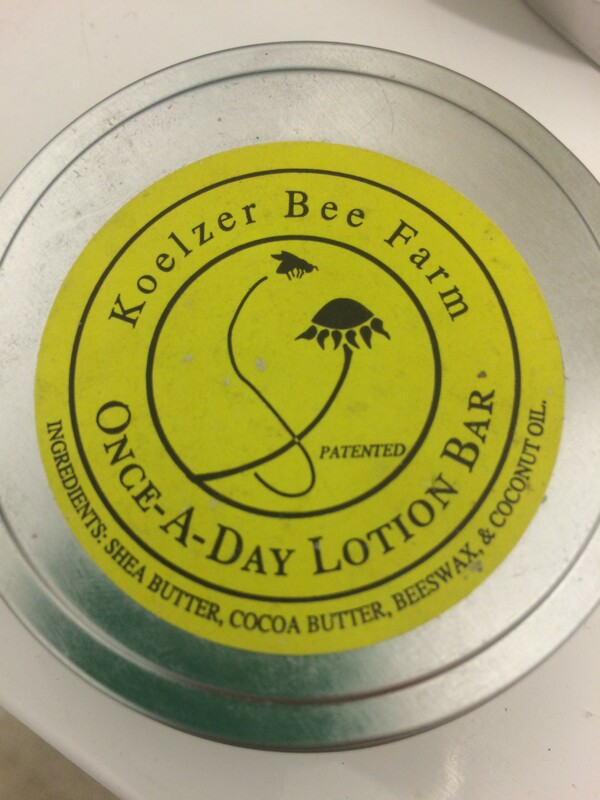 She got me one from Koelzer’s Bee Farm, so I gave lotion bars a second chance (thank you, Betsy!). Immediately, I liked this product. It was a little softer than my first bar, and I loved the smell—the faintest hint of honey. The tin containing the bar also claimed that this lotion could be applied just once a day and wouldn’t fade away with frequent hand washing. I found this, surprisingly, to be true. My skin remained soft for hours, and the consistency made this bar a breeze to apply in the morning. Already, the Koelzer lotion bar is gone. I used it remarkably quickly. I’m thankful that this product not only worked but also encouraged me to give my LUSH lotion bar a second chance. Once the Koelzer bar ran out, I reopened the forgotten LUSH tin and unexpectedly had much more success with it on the second go-round. Perhaps I have accepted the added minute it takes to apply this lotion (still longer than creamy, liquid lotions, but not by much), or perhaps my new apartment is slightly warmer than my old apartment, making the bar softer and easier to spread. Or, maybe I’ve just improved my technique: I have found that if I actually use the edge of the lotion bar instead of the flat surface, I can quickly swipe it across my skin, leaving a trail of moisturizer that I can then rub in with my greased-up hands. Probably, it’s a combination of all of these things. Whatever the main factor, I’m glad that I’ve turned a corner with adopting a plastic-free lotion. 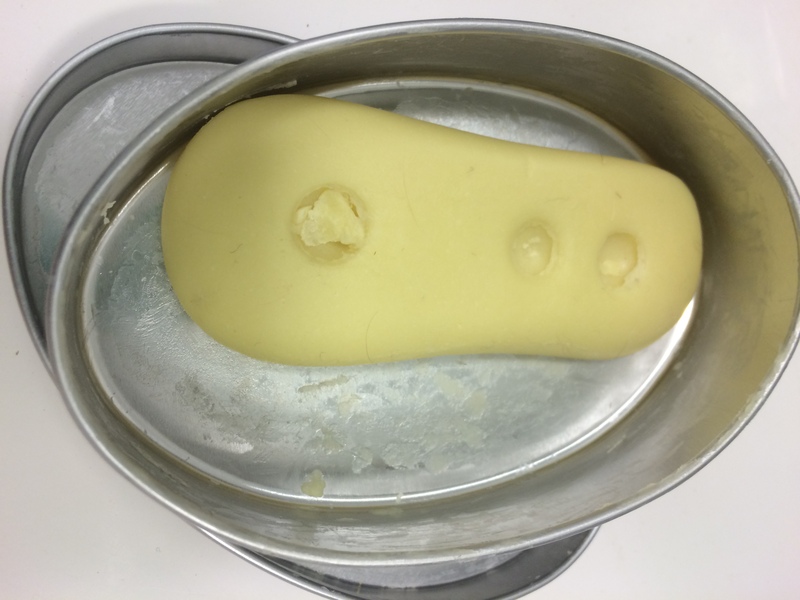 My Lush lotion bar that has been given a second chance. Turns out it spreads easily on its side! Still, lotion bars aren’t quite as convenient as “normal” lotions. I don’t have nearly the same number of choices when it comes to smell or variety. 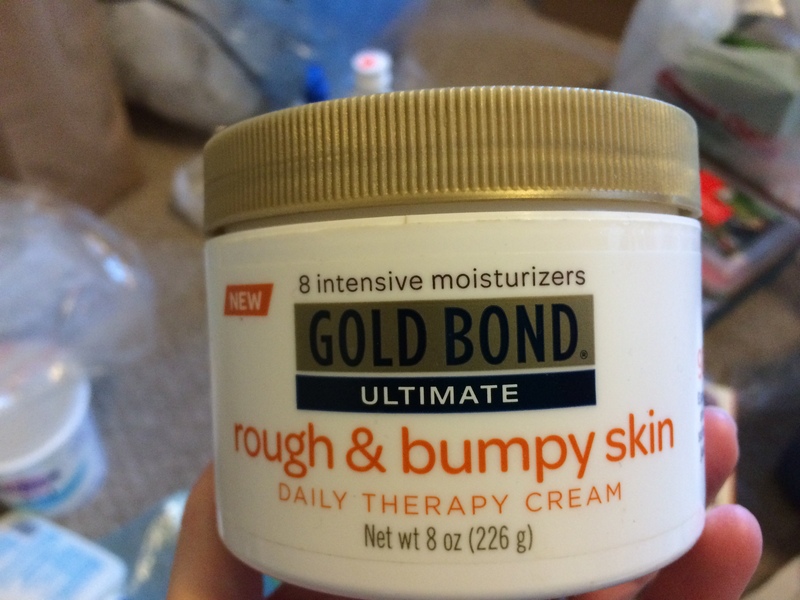 For example, for a while, I was using a really excellent lotion from Gold Bond that works wonders on my dry skin. Frequently, especially in dry months, I get small red bumps on the back of my arms, related, maybe to eczema or allergies. When I’ve used this tub of lotion, the red bumps magically vanish. My lotion bars don’t quite add up to the caliber of the Gold Bond lotion, so spreadable and skin-soothing. But that’s the case with most plastic-free alternatives—limited choices. Amazing Gold Bond lotion. Sigh. Plastic, plastic, plastic. I’ve also continued to hear about the power of coconut oils, but I haven’t found any that come without plastic packaging marketed purely as skin moisturizers. Those of you in the know about coconut oil, can I buy just a regular old tin can of the stuff and spread it like lotion? Have you done this with success? I’d love to hear your thoughts! Overall, despite the slight drawbacks of lotion bars, I really do feel I’ve turned a corner with them. With April 22nd on the horizon, the day my challenge will officially end, I’ve begun thinking about plastic-free products and habits that will remain with me after this experiment, about the specific ways I’ll continue to live my life without a dependency on plastic. I think lotion bars might be one of those forever products.